In lieu of a wedding gift this tribute is made for the Jackson’s beloved family friend- Rosa – who left this world on 4/13/17. Her cat friend misses her. In memory of Amanda’s beloved Jack. Merry Christmas! Love – Karen, Adam, Emma, Ping Pong. In memory of Martini. To Rebecca, a wonderful sister and a friend to animals! Happy holidays and Happy New Year. In memory of Pork Chop and Candy. For Debbie Krumwiede, my cousin who has rescued 3 Boxers. 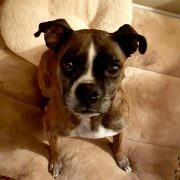 She loves her doggies and we hope this donation will help you rescue even more Boxers. In lieu of a wedding gift this tribute is made for the Jackson’s beloved family friend- Rosa the dog- who left this world on 4/13/17. Her cat friend misses her. 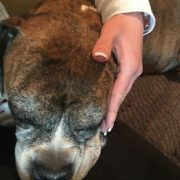 In memory of sweet Brindle Boxer, Cali, now with her good friend, Willow, missed by her parents, Jason and Jill. 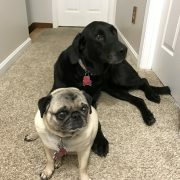 In memory of Roseanne, proud mom of Titan and Boo. In memory of my special little Sis, Roseanne Robertson. I’m grateful you were in my life. In loving memory of Roseanne Robertson. 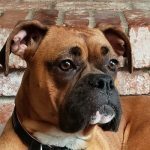 In memory of Roseanne Robertson, animal lover and boxer mom. In loving memory of Rose Robertson. A wonderful, loving, optimistic person who loved Boxers and rescued many over her lifetime. You will be truly missed – will always remember your smile and laughter and the joy you brought to others lives. In memory of Roseanne Robertson who loved all living things, but particularly Boxers. In memory of Gail Barber. In loving memory of Gail Barber. I will miss you so much, Gail. You had a quick wit and we became fast friends. 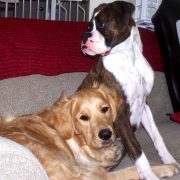 Your love for the Boxer breed was what brought us together. I’m sure Buddy was thrilled to see you at the Bridge. 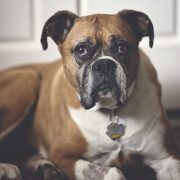 In memory of Duke, my friend Pat Cheney’s 12 year old boxer who lost his fight to cancer. In memory of Gail Barber whom we lost today. She was a lover of animals, and especially fond of Boxers – rescuing several over the years. 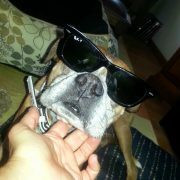 You will be greatly missed by family, friends and 4-legged-friends alike! It has been two months since we lost you and we miss you every day. This is in memory of you Uncle Bob! 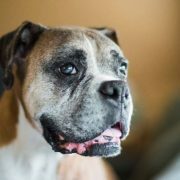 A true lover of all animals, mostly the mammal kind, but I know you would appreciate me donating to my love of boxers!! May you rest in peace and know you will forever be in our hearts!! In memory of Jett, Jule, Leo (NCBR Alum) and Lacey (NCBR Alum). You all are here for such a short time. From the parents who support The Mill Valley Children’s Garden at Edna Maguire Elementary School in Mill Valley, to recognize and thank John Ossa. Maggie McCaffrey brought a lot of love to Podcast Unlocked. I’ll miss seeing her happy face. Hope she’s eating In ‘n Out doubles up there on the Rainbow Bridge. For my friend whom I have never met except through the subtleties of the internet, Maggie McCaffrey. May her light still burn brightest yet. To Maggie McCaffrey and all the smiles she brought. In honor of Beth and Matts, sweet Amy’s mom and dad. You were such good parents to Zoe, and gave her the best she could have. She will be profoundly missed. 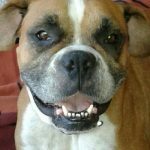 In memory of Bruce Williams, a journalist and activist, who lived with rescued Boxers. In memory of sweet Leo. Your family misses you and you were loved beyond belief. 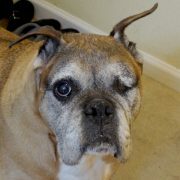 In memory of Sweet Freddie, Norcal Boxer Rescue. Caroline was a most kind and caring animal lover who will be greatly missed.